You are here: Home / Health / Five Unique Ways to Treat Back Pain. Five Unique Ways to Treat Back Pain. (ThyBlackMan.com) A lot of people have had a first-hand experience of how debilitating back pain can be. In truth, back pain is a problem that can come up from time to time, which is why it helps to know a few tricks or two on how to deal with it. Luckily, in a majority of the cases, the back pain is not serious enough to require the use of medical procedures. The interventions below can help alleviate back pain by strengthening the muscles that support the back. The benefits of exercise to those suffering from back pain can be quite extensive. For one, thing, exercise can help dull and eliminate throbbing back pain. Additionally, targeted physical workouts can also strengthen back muscles so that you do not have to be as vulnerable to back pain in future as you currently are. For best results, these workouts should be done under the guidance of a physical therapist to ensure that they actually improve back health. That’s because doing the wrong workouts might actually make the problem worse. In particular, extending the muscles on your back has proven effective in many back pain cases. 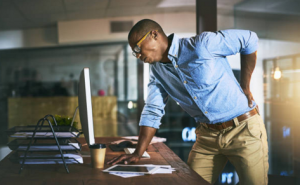 Quick stretches can help alleviate back pain and resolve it completely if it is not caused by any serious underlying issues that would demand more serious medical interventions. There are a couple of instant home solutions you can use to relieve back pain when it seems to keep interfering with your life. For instance, you can apply an ice pack to the painful area. You can also try using options such as CBD oil. The best CBD oil on the market should provide a significant level of pain relief when your back starts aching. An hot shower might also help with back pain. The shoes you wear can also have an impact on your back pain. Generally, you should put on shoes that have cushioned soles and plenty of ankle support. Without proper shoes, you can develop new back pain issues and even exacerbate the back pain issues you are already going through. This also means that when a shoe has outlived its effectiveness, it is best throw it away since its uneven and worn out sole might be the reason you are going through consistent back pain problems. Technically, yoga is a form of workout. But it stands out for the fact that it offers unique back pain relief and general fitness benefits far beyond what typical gym workouts can give you. For instance, in addition to improving general health and fitness due to the stretching exercises that come with this ancient physical art, you can also improve your general well-being and outlook on life so that you end up making better health choices that reduce incidences of suffering from lower back pain over time. A wait and see attitude might not sound like good advice, but if you have no persistent back pain problems, it might actually be a solution worth considering. Most people do not have serious back problems requiring interventions such as MRIs and other scans. Usually, a little patience is all that is needed and the pain will subside and disappear on its own. For instance, in cases where the pain comes about due to something like an overly demanding day of physical labor, a poor sleeping position and so forth. Above are some special interventions you can use to deal with back pain and even keep it from being too big of a problem in future. Basically, immediate interventions you can use to deal with back pain include using ice packs and stretching exercises. However, you can also try natural remedies such using CBD oil and taking hot showers. Other options you can try include yoga and ensuring you wear shoes that fit you properly. Waiting also works for some people. However, for long term solution to recurrent back pain issues, you should try things like exercise and yoga. Low Back Pain has become a global epidemic and while wearing the right shoe is important, shoes are not made to give the body the full support it really needs. That is why so many doctors recommend Foot Levelers custom orthotics which are clinically proven to reduce low back pain. Shoes that have outlived their effectiveness can cause or make back pain worse. However, shoes do not correct imbalances in the feet that cause misalignment and pain in the body. Foot Levelers are prescription “shoe inserts” that are custom-made and replace the generic insoles that come with shoes. They are designed to correct foot problems and help restore balance and body alignment. By providing proper support for the back, knees, hips, ankles, and pelvis with a balanced foundation, Foot Levelers custom orthotics help reduce pain in the body, provide comfort, and improve performance.